Some residents were puzzled last month when signs went up on Cornell Road that said “Welcome to Beaverton.” Was there a stealth annexation that nobody heard about? Well, no, that section of Cornell was annexed into Beaverton in 1999 along with portions of Science Park Drive, Murray Boulevard, Highway 26 and the land under Sunset High School and Sunset Park. These are commonly known as “cherry-stem annexations,” and are increasingly frowned on by Washington County and planning experts. They often lead to “island annexation” where a city claims that their territory surrounds an island because they annexed the roads (cherry stems) that surround it. Holly Thompson, spokesperson for the Beaverton Mayors’ Office, says that the road signs went up as a result of a periodic review of signage conducted by the city traffic engineers. “We are required by Federal radar law to post signs at major entry points to the city. We periodically review our signage and decided that we needed to put signs up in this area,” she stated. Beaverton has been using their portable radar vans to catch people “speeding” past Sunset High School over the 20-mph school area limit for some time. They have no plans to install permanent radar cameras, according to Thompson. Placement of the sign on the north side of Cornell does seem a little curious since the Beaverton “city limit’ only extends to the sidewalk — the Safeway shopping center is still in unincorporated Washington County. We’re sure the engineers knew what they were doing, but it caused some confusion among local residents. The map shows which parts of Cedar Mill have been annexed by Beaverton. 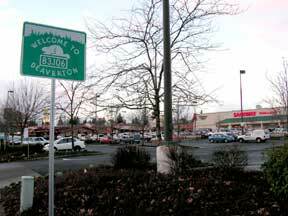 Most of this annexation has taken place during the last ten years, during which Beaverton grew by over 2500 acres. Much of the annexation around the region was “voluntary” on the part of landowners who were developing property. When Beaverton owns the roadway, they also own the utilities that are placed beneath it. When a developer wishes to, for example, hook up to the sewer, they have to annex into the city to be able to do that. This is part of the reason that the Teufel development annexed into Beaverton. A few days before Wal-Mart applied to build a store on Peterkort property at Cedar Hills Boulevard and Barnes Rd., the property officially became part of Beaverton as the result of a forced island annexation – Beaverton having previously staked a claim on Cedar Hills, US 26 and Barnes. One of the reasons that the Beaverton City Council ultimately rejected the Wal-Mart application was that under Beaverton law, the zoning regulations for both the City of Beaverton and Washington County applied to the building application until the City changed the zoning. The County’s code requirements were stricter than those of the City regarding the transit-oriented nature of the area. Last fall, at the request of City planners, the Beaverton Planning Commission approved a change to the way the City applies development codes in annexed areas. Under the changed procedure, the City would continue to apply the County’s zoning designations, but not the County code requirements specific to those zones. Instead, the City would apply its own generic code requirements. These requirements are much weaker than those of the county, and in the case of the Peterkort property would strip away County standards for access, pedestrians, building orientation and block size. The net effect would make it easier for developers to get approval of big-box development. The group that opposed Wal-Mart, “Save Cedar Mill,” filed an appeal to the Beaverton City Council that was supposed to be considered at their December 4 meeting. Steve Kaufman reports that, “The County asked for a postponement, as they had just heard about the text amendment and hadn’t had time to study its impact. I believe that bodes well for us in the long run, as I can’t believe they’ll support an amendment that allows the City to toss out their codes.” Stay tuned, we’ll report again on this issue after the Council takes it up on February 12.